When Street visited the picturesque village of Felday in Surrey in 1872, his wife Mariquita liked it so much that she described it as "Heaven's Gate." The couple decided to move there, and Street began to build a large house, Holmdale, its name inspired by the village's position in the valley below Holmbury Hill. Unfortunately, Felday really was "Heaven's Gate" for Mariquita, who died in 1874, before the house was completed. Street remarried in 1876, only for his new bride, Jessie, to fall ill on their honeymoon and die soon afterwards. 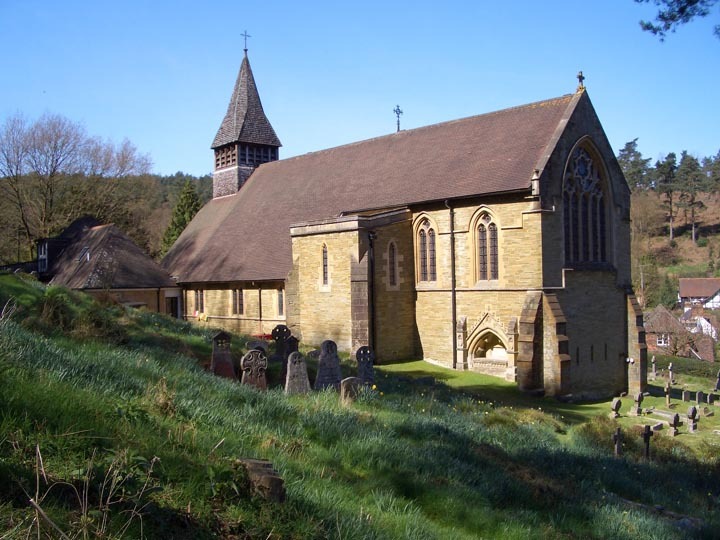 As a devout adherent of the Church of England, he designed, oversaw and paid for the building of a new parish church, St. Mary the Virgin, in her memory. He used local stone, with Bath stone as a feature around the windows and so on. Most of the stained glass was also designed by Street. The church was completed in 1879. In the same year, the village was combined with nearby Pitland Street and renamed Holmbury St. Mary, after Holmbury Hill and the new church — an unusual case of a village being named after a church. One of Street's last works, it is certainly a very striking piece of Victorian church architecture, especially when approached unexpectedly from the winding B-road. This is partly because it was built on a steep slope, which makes it look taller than it actually is. The unconventional design (necessitated by the slope) has been criticised, but the church is still widely admired. Street died in 1881, at the age of 57, soon after suffering a stroke while walking home from the local train station at Gomshall. His death is said to have been hastened by the strain of working on the Law Courts in the Strand.